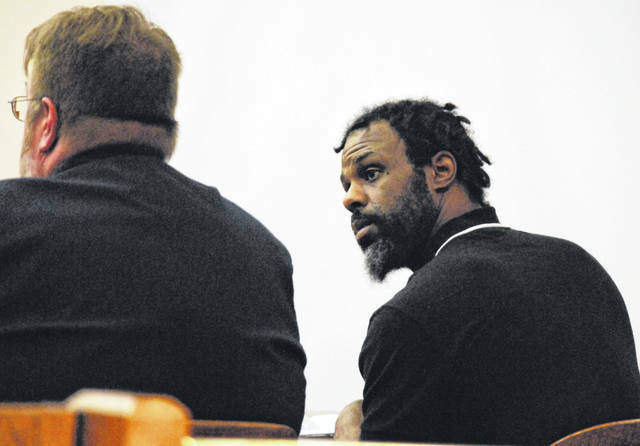 Day two in the jury trial of Lima resident Willie Foster, right, began Wednesday with the defendant’s request to fire his court-appointed attorney attorney, Steve Chamberlain. Allen County Common Pleas Court Judge Jeffrey Reed denied that request and the trial contined. But prior to the afternoon session Foster agreed to a deal with prosecutors and pleaded no contest to the five felony charges against him. The deal with prosecutors caps his possible prison time at 15 years. A jury was seated Tuesday morning in the case against Foster, 38, who was charged with aggravated burglary and kidnapping, first-degree felonies; attempted felonious assault, a third-degree felony; and two fourth-degree felony counts of domestic violence. Prosecutors say Foster entered the locked West O’Connor Street home of Kiera Watson, his former girlfriend, while the woman and her 3-year-old daughter were sleeping on July 8 of last year. The woman told police Foster slammed her head into a dresser, strangled her and told her he was going to kill her. After escaping their attacker, the woman and her child, Foster’s biological daughter, were treated at a Lima hospital for cuts and bruises. Jurors on Wednesday morning saw photos of Watson with visible black eyes and spots in her head where her hair had been pulled out. The morning started in dramatic fashion when Foster sought to dismiss his court-appointed attorney. Claiming ineffective representation had been provided by Attorney Steve Chamberlain, Foster claimed his constitutional rights had been jeopardized by sporadic interaction with his lawyer. Foster also claimed he had not previously seen photos and videos introduced by the state during Tuesday’s opening day of trial, another infringement upon his rights. “I would like to hire a new counsel; I feel I don’t have proper counsel presently,” the defendant said. Assistant Prosecuting Attorney Destiny Caldwell reminded the court that Foster had rejected a plea on Jan. 4 during open court. Reed asked Chamberlain if he wanted to step down from the case or how he would prefer to continue to represent Foster. “At this point, I know Mr. Foster does not have confidence in anything I do and, frankly, I will do as the court wishes,” the attorney said. Amid verbal sparring with the defendant, Reed said he found it curious that Foster had not mentioned problems with his attorney until the trial’s second day. Testimony continued until the lunch recess, but before jurors returned for the afternoon session a deal had been struck between the defendant and prosecutors. In exchange for a plea of no contest to all five charges, the state agreed to a maximum prison term of 15 years. Foster initially faced up to 28 years if convicted of all counts. He will be sentenced March 11.